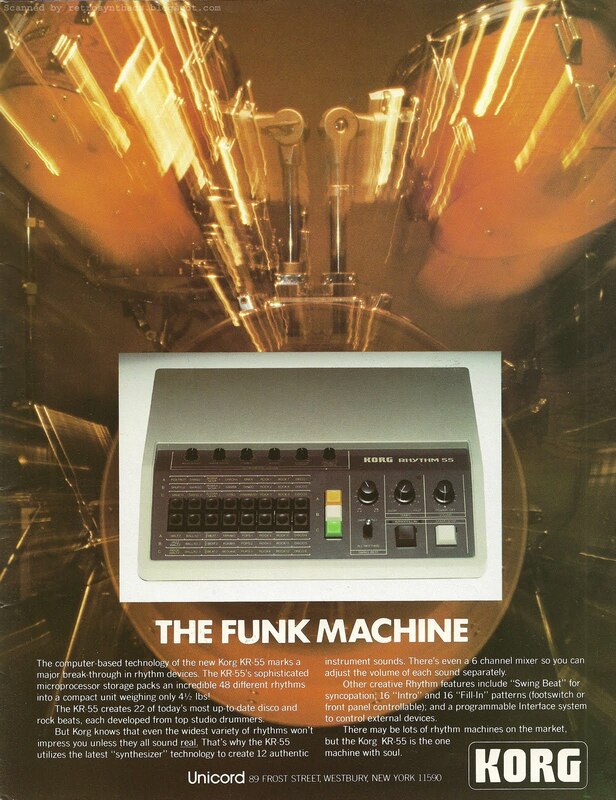 Korg KR-55 drum machine advertisement from back inside cover of Contemporary Keyboard February 1981. Researching the KPR-77 for my last blog post got me increasingly interested in Korg's earlier drum machines, so I thought I would do a bit more digging into Korg's earlier ads and see what was up. As I looked through back issues of CK, it seemed to me like the the KR-55 was the first Korg rhythm machine to be advertised in the magazine. I found this a little surprising because Korg released a number of drum machines previously, including the Mini Pops MP120 and MP35, as well as the SR120 back in 1976. 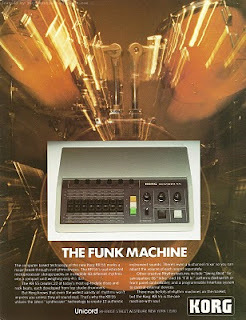 But it turns out that Korg didn't start advertising in CK magazine until 1977. That early on, they didn't advertise much either. During 1977, Korg only advertised once for the Korg Maxi-Korg K3 in the January 1977 issue, a product that was actually launched in 1975 (must have just taken a while to get across the pond). Then Korg went silent again until July 1977 when they advertised just once again for their Ensembles. I'm thinking the KR-55 also took a while to get to the U.S., because this ad oddly describes the KR-55 as "new". Most sites and online references such as Vintage Synth Explorer give the launch date of the KR-55 as 1979, and for a second there I thought maybe Korg was just getting a jump on advertising for the KR-55B (launched in 1982). But the characteristic colouring of the case along with the rest of the ad-copy describing the 48 rhythm patterns and all that, tells me they were definitely referring to the original. But, in true Global-Wikipedia fashion, I did have to be reminded about the July 1979 Disco Demolition Night riot where the "angry backlash against disco music and culture" peaked. Boo on them. Boo to the angry people. And thank-you to the rest of the world where "the genre continued to be popular elsewhere during the 1980s". You guessed it. I'm a closet disco fan. Just never wore the tight pants. Well, it may not have been their best year, but I wouldn't say it sucked bum either. "More successful [than the Sigma] were the KR33 and KR55 rhythm units, which replaced the ageing Mini Pops series. These were more sophisticated than their predecessors, generating analogue sounds that were far more realistic than the noise-based thumps and hisses offered by the earlier DoncaMatics, Mini Pops, and units from competitors." But I have to say there was one specific fact that I found on the Web that really peaked my interest in the KR-55. The KR-55 was used by Depeche Mode on "Speak and Spell". And with "snappy" being one of the most common adjectives to describe the KR-55 sounds, I'd believe it. But, there is some debate out there, and you can find a compressed version of the argument on Jaakko Suominen's "Depeche Mode Keyboards And Other Tech Stuff" Web page. "I SPOKE TO VINCE CLARKE A COUPLE OF YEARS AGO AND HE TOLD ME THE DRUM MACHINE USED ON SPEAK AND SPELL WAS A KORG KR55 PRESET MACHINE .THE BAND USED JUST THE SNARE AND HIGH HATS SOUNDS FROM. THE BASS DRUM WAS GENERATED FROM AN ARP 2600 SYNTH WHICH WAS SYNCHED TO THE MACHINE AND AN OLD ROLAND MC4 MICROCOMPOSER SEQUENCER. SO THERE THE ANSWER IS!THE SAME MACHINE WAS USED ON MOST OF THE EARLY DANIEL MILLER PRODUCED TRACKS INCLUDING THE FAD GADGET STUFF LIKE 'RICKYS HAND AND THE FABULOUS MEMORABILIA BY SOFT CELL!! PS .BOBBY ORLANDO ALSO USED ONE ON THOSE FANTASTIC TRASHY NY DISCO RECORDS BY DIVINE AND THE FLIRTS (PASSION ' NATIVE LOVE SHAKE IT UP ETC..)"
End note: I have to admit, the first thing I did when I came across this ad was read carefully through the ad-copy to see if Korg referred to the KR-55 as a "rhythmer", like they did with the KPR-77. Nerp.